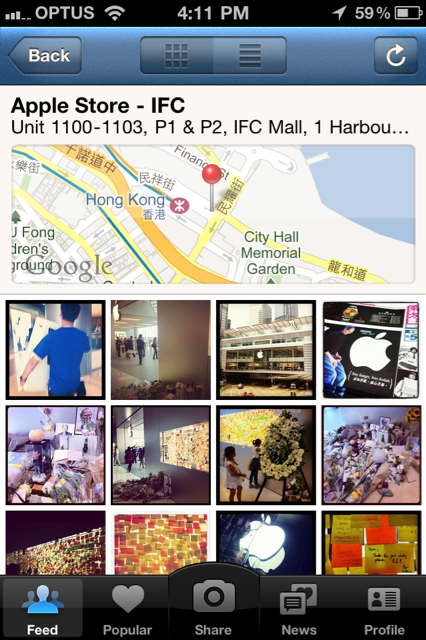 Instagram iPhone app shares photos and groups photos with others by location. This makes it a fabulous social and fully open pictorial message board when events of any kind occur. The tributes of an actual apple, a weird Steve figurine and a co-ordinated, colourful wall of post-it notes at Hong Kong Apple Store also shows how stylishly memorials can be. If Instagram had been popular during the Christchurch earthquake or Queensland floods, for example, searching for photos by location could have been invaluable for sharing of realtime updates locally and globally. The Steve Jobs memorials at Apple Stores worldwide show the sentiment shared worldwide is a more powerful force for showing people’s sameness across borders and cultures, our shared humanity… as long as it is searchable and easily viewed.